" FINALLY, WE ARE BACK TO RUNNING DOGS IN THE NORTHERN FOREST!" Kara took this photo as our team returned from a 10 mile run on Saturday. As you can see, we had to break our team down to 8 dogs for safety due lack of snow. We have had, what seems like, a long layoff due the 2 days of rain we received over the New Years weekend. After the rain, it turned cold and everything froze up making the trails icy and dangerous for training. Due to the lack of snow & poor conditions , the first race of the season here at Saint Michel Des Saints was cancelled. This was a shame for the mushers and also the organization that was putting on the event. But, for safety of the dogs they made the correct decision. The dogs ran well considering the long layoff. We broke the team down to 2 teams of 8 dogs for safety and control due to the lack of snow. On Friday, we received about an 1" of snow. That was enough to cover the ice. The dogs handled the layoff better than the mushers. However, there is no control over Mother Nature! If all goes well, we are planning on running 12 dog teams next week to prepare for our next race on January 22nd & 23rd. 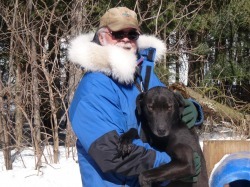 One of the high-lite of the week was Carl Routhier coming here and picking up his 5 dog team. We wish Carl all the success & fun of running Sled Dogs.